I have to start with stating the obvious. Scotland is a really lovely country. At least, it is when you get several dry days in a row, which is pretty unusual. Having snuck in a judicious rest day to avoid the rain back down in Irvine, three days’ riding has taken me all the way from Ayrshire to the capital of the Highlands, Inverness. And the worst weather I’ve seen was a bit of drizzle yesterday (Tuesday) morning. It wasn’t much. The locals were still calling it a ‘fine’ day. But then they have about a hundred words for varying degrees of precipitation up here. Leaving Irvine in the sunshine, I got to ride a converted railway line most of the way to Glasgow, which was a good break from the traffic. It was also nice and flat, which proved to be the case most of the way to Inverness. Odd, given that I was heading through the highest mountains in the UK. I crossed the river Clyde (where, in the not-so-distant past, about half the world’s ships were made) on the Erskine Bridge, which was actually the biggest climb of the day. I was on the wrong side to get a panorama of the city of Glasgow, so had to content myself with the arguably more photogenic view out towards the sea (above). 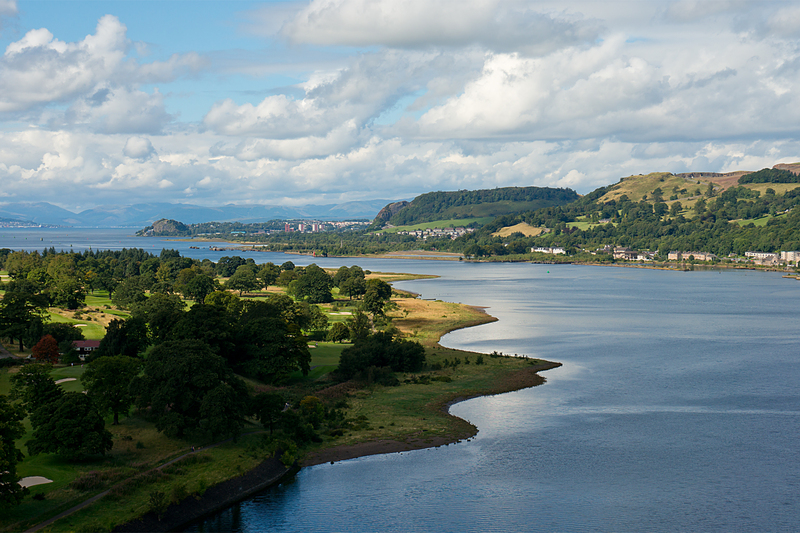 Once out of the last suburbs around Dumbarton, you’re pretty much straight into stunning scenery for days. The main road runs alongside Loch Lomond, and therefore remains flat, while the mountains rear up on all sides. The only big problem with Loch Lomond is that it’s enormously popular with tourists and locals alike, which drives up the prices. Having got about halfway up the lake, it was time to find somewhere to get my head down. 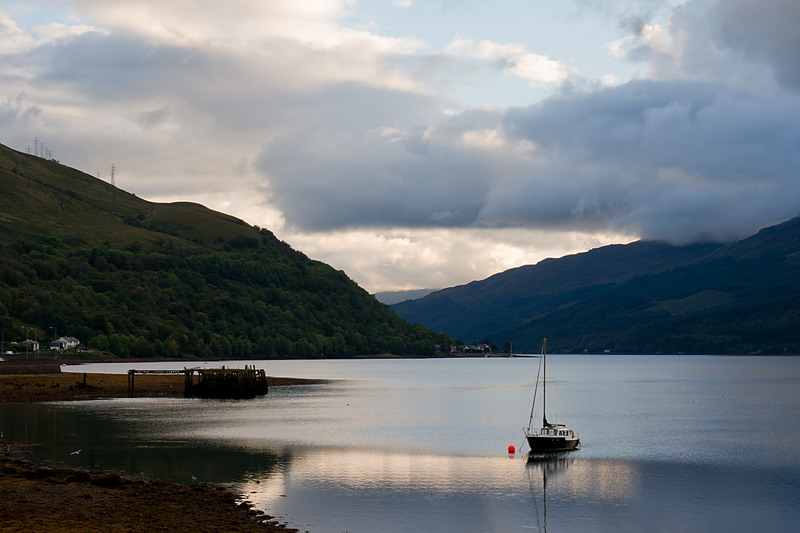 And by taking a two-mile detour to the very end of the next loch to the west (Loch Long), I managed to halve the price of accommodation, and end up with the rather delightful view above as the light faded. It’s hard to find an ugly area in this part of the world, but the road across from Loch Lomond to Fort William must be one of the most beautiful around. It was also the hilliest section of the last few days. That’s all relative, though; Scottish roads tend to be much more sensibly engineered than many in England, probably because they’re mostly much more recent. From Loch Lomond, you spend about twenty miles slowly gaining height, with only a few really noticeable ramps. Plenty of flat areas in-between to recover. It’s the easiest way to climb on a loaded bike. And having run across the tops for a while, you get dropped back to sea level via stunning Glencoe (below). It’s a spectacular ride. Not everyone seems to enjoy it as much as I did. As I was filling my face with (yet) another Scotch Pie at a petrol station at the bottom, another loaded tourer pulled in, having come over the hills on the same road. He was that rare breed of grumpy cycle tourer (I’ve only ever met a couple), and hadn’t had a good day at all, apparently. 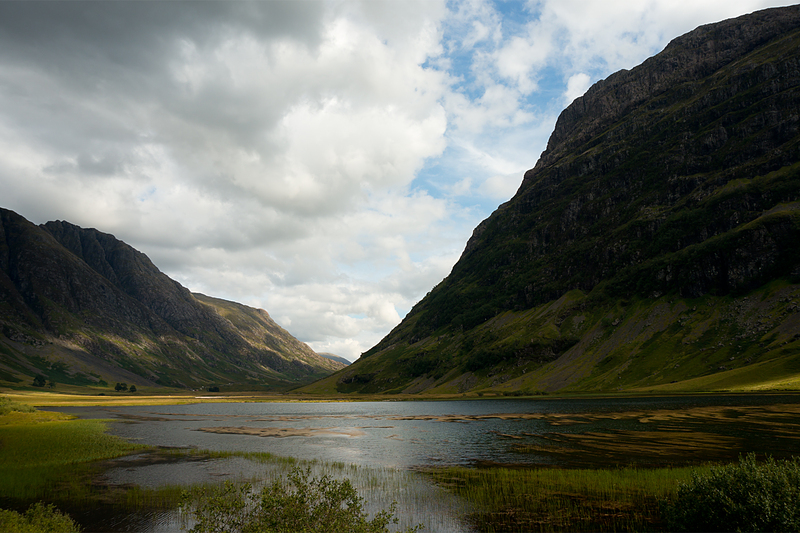 While he acknowledged that the weather was surprisingly good, and that Glencoe was lovely, he said he’d been in fear of his life most of the way across, because of the traffic. Now, it is a busy road, and there were quite a lot of trucks and tour buses about, as well as distracted campervans. But then, it’s also the only main road north from Glasgow, so it’s unlikely to be quiet. I’d thought it was all pretty well-mannered, especially in comparison with, say, Jakarta or central London. And there aren’t all that many roads this far north, so they’re probably all like that. Still, I had my own trip to worry about. 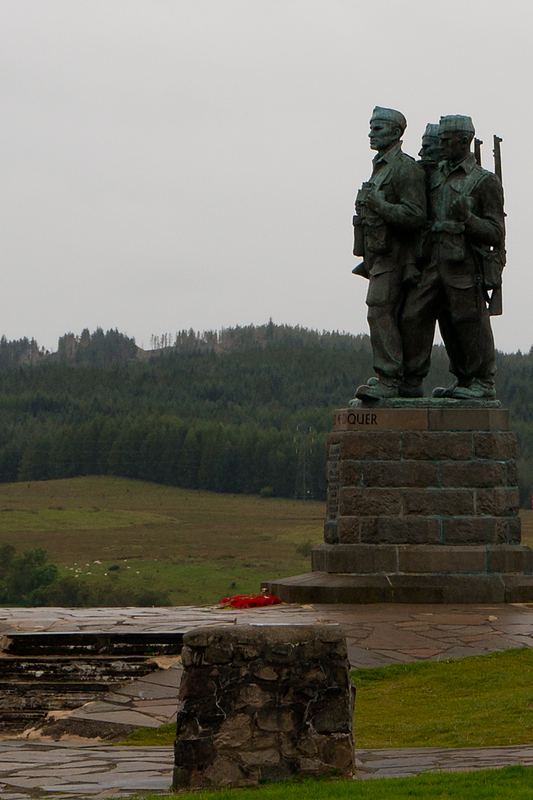 And, after that drizzly and murky start yesterday (possibly appropriate as I passed the Commando memorial on the road from Fort William), I had the rest of the Great Glen to cover. It’s probably the easiest way to ride coast-to-coast across the UK. The Great Glen is a massive fault-line which cuts straight across Scotland. 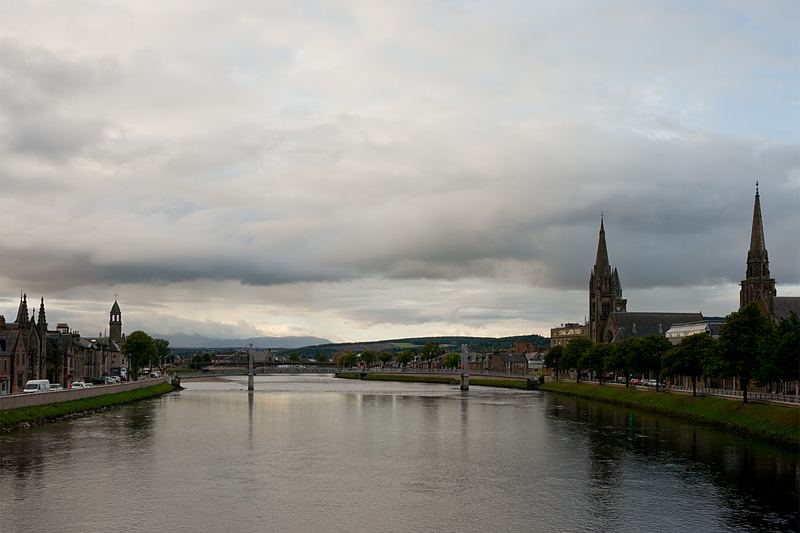 Fort William is on a sea-loch in the west, and Inverness is on the east coast, sixty-odd miles away. You can easily do it in a day. The road has a few ups and downs, but basically contours along the water in the bottom of the valley. It’s really easy riding (again, subject to your tolerance to tour buses). 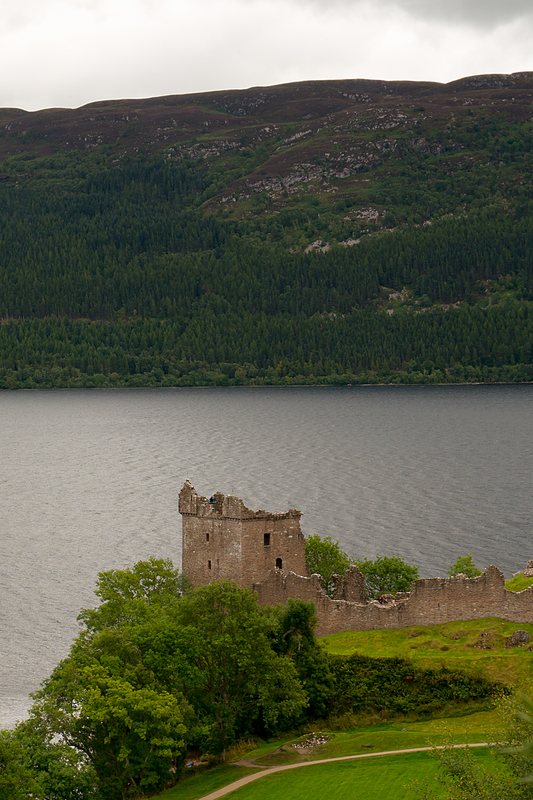 The biggest, and by far the most famous, of the lochs in the Great Glen is Loch Ness (above). Despite the best efforts of various hoaxers, poor Hollywood films and the local tourist industry (‘Nessieland’? Really? Yes, really…), there’s very little evidence that it’s anything other than a big lake with some picturesque ruined castles. As you get to the north-eastern end of Loch Ness, the hills on either side begin to flatten out, and you’re on final approach to Inverness. This is pretty much the last city in Scotland (I’m not sure whether anywhere else claims city status, but there’s certainly nothing bigger than town-sized any further north than this). I’m tempting fate a little by having another rest day today (Wednesday) while the sun’s out; there’s a fair chance that I’ll cop some poor weather as I head further north to Shetland. But my socks need washing, so a rest day it has to be. Assuming all goes well, I’m only two (long ish) riding days from John O’Groats (which is fairly close to the top of Great Britain), from where it’s not too much further, and somewhat ferry-assisted, to Orkney, Shetland and the top of the UK. Sounds like a lovely ride. You have sold Northern Ireland and Scotland as a tour. Training and saving for summer 2017! Good luck for the last leg. Cheers, mate. Last leg sorted, I just can’t post about it cos the net is hopeless up here… What’s wrong with 2016?